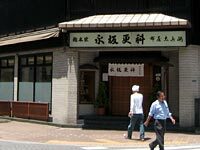 Nagasaka Sarashina (soba restaurant) was founded in the late 18th century. Azabu-Karinto (fried dough cookies shop) opened shortly. 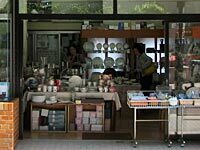 Tatsumi (European tableware shop) was founded in 1945. 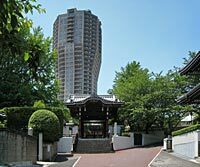 Azabu is known as the most exquisite and probably the most international residential area in the center of Tokyo. Exactly speaking Azabu consists of elegant residential areas on hills and popular commercial areas on lowlands along Furukawa River. 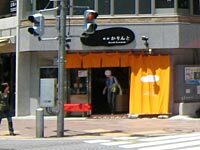 Azabu-Jūban is the most traditinal and lively commercial district in Azabu and it has recently acquired fashionable and trendy elements as well thanks to the urban redevelopment. It is said that Azabu-Jūban was a very popular commercial district in the Meiji Period (1868-1912). However, the prosperity was gone after the war and in particular the dismantling of tramcar lines in the 1960s made Azabu-Jūban as if it were an isolated island. 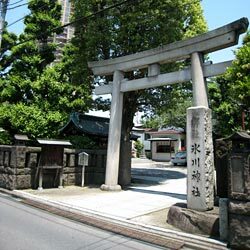 As a result, in the last decades of the previous century, Azabu-Jūban was a sort of secret haven for a limited number of well informed people who wanted to find their refuge away from the hustle and bustle of Roppongi and Akasaka. However things have drastically changed in this century. In the year 2000 two new subway lines Nanboku Line and Ōedo Line were completedand and both lines opened a station in Azabu-Jūban. Three years later Roppongi Hills, a large scale urban development project with the 54 story Mori Tower as its centerpiece, opened right next to Azabu-Jūban. 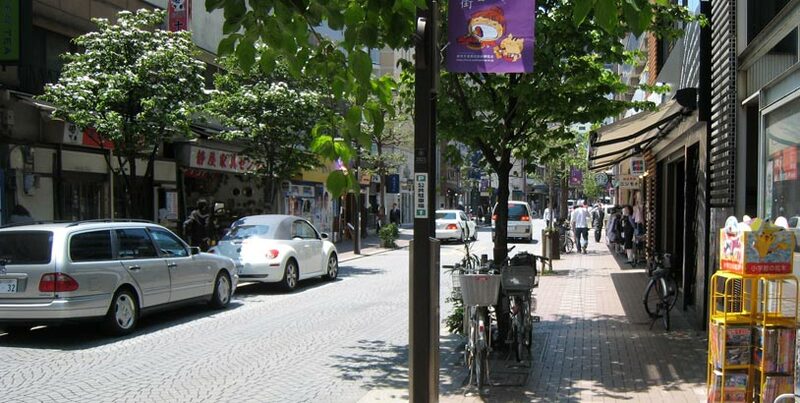 Azabu-Jūban suddenly became the most wanted residential and commercial area and changed the life in the town. Young people began gathering and living in Azabu-Jūban and new trendy restaurants and shops began opening. I was worried whether Azabu-Jūban might change to be a faceless commercial town like thousands others. However, that is proven to be a groundless fear, at least by far. Azabu-Jūban has its resilient family business tradition and the majority of shops and restaurants are still owned and operated by families. Many newly opened shops and restaurants are also managed independently from big chains. The town is not as much overwhelmed by entertainment industry as in Roppongi and Akasaka, but high quality shops and restaurants and their loyal clients characterize the street view of Azabu-Jūban .... at least by far. This lovely statue of a poor little girl is now the symbol of Azabu-Jūban. In the song text she was said to leave Japan from the habor of Yokohama and there is also her statute in Yamashita Park in Yokohama. 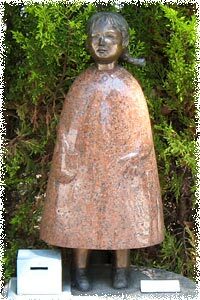 An attraction of Azabu-Jūban is the stone figure of a little girl Kimi-chan. According to the widely accepted story, this girl was given to an American missionary for adoption, because her mother could not take care of her because of hardship work with a new husband in a reclaimed land in Hokkaido. Mother believed that her daughter was taken by her step parents to the US and lived happily there. However, she got tuberculosis and could not accompany the step parents to the US, lived in an orphanage in Azabu-Jūban till she died in the age of nine. A poet wrote a poem on Kimi-chan on the basis of her mother's explanation and it was widely circulated in Japan with a somewhat melancholic melody in the 1920s; the title of the song is "A girl who used to wear red shoes". Though the real story might be somewhat different, the song reminds us of the poor past of Japan and the vague sentiments of Japanese people for the exotic merica. A highrise condominium looks like a huge buddha statute, doesn't it? Compare with the photo taken in 1861 when the American legation was located here. Another interesting place in Azabu-Jūban is Zenpukuji-Temple. 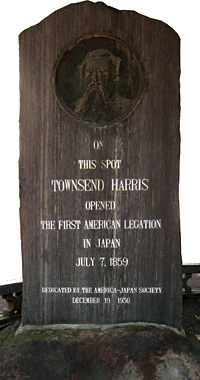 Tawnsend Harris came to Japan as the first American Consul General in Japan and resided in Shimoda in 1856. He negotiated with the Shogun Government and succeeded in the conclusion of "Treaty of Amity and Commerse" in 1858. He was then appointed to minister and opened at Zenpukuji-Temple the first ever legation of foreign countries in Japan in 1859. However, the legation did not stay here long, because it had to move out to Yokohama as the temple building was burnt down by fire in 1863. Later, it moved to Tsukiji and then to the present place at Toranomon. We can find a massive stone memorial of the American legation and Tausent Harris in the court yard of Zenpukuji Temple. Unfortunately a newly built high-rise condominium destroys the view of the temple from its main entrance. The temple expresses its dissatisfaction on a flyer hanging in the court and I agree to it. 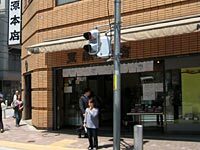 Azabu-Jūban became also known to girls anime fans in the 1990s, because "Sailor Moon" series was at the time broadcast and Sailor Mars, one of the main figures of the anime, is supposed to work as a shrine maiden at Hikawa-Jinja in Azabu. Hikawa-Jinja also accomodates Bishamonten, one of the seven gods of fortune as I explained in a previous article.